I’ve been out of the loop with the Barefoot Bloggers for far too long, and I think its time I get back on the horse. 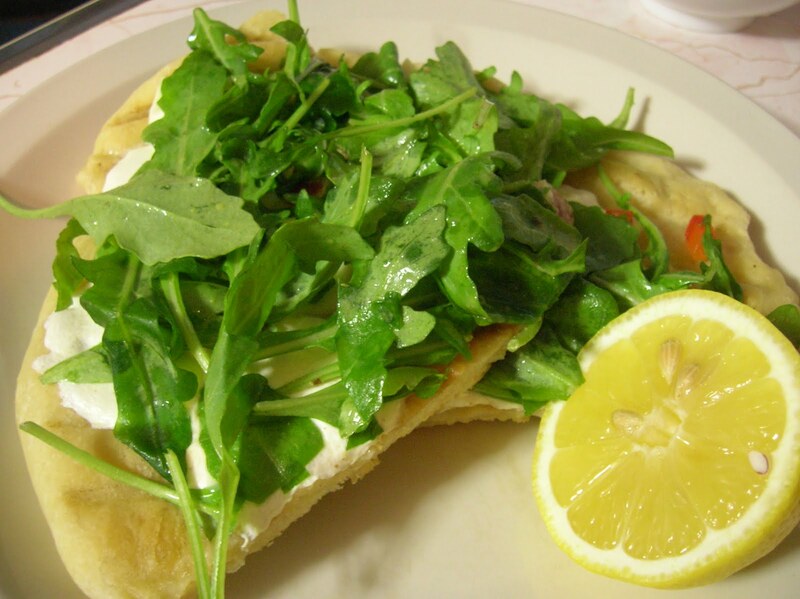 I’m not sure if I’ll get through both recipes this month, but if I was going to choose only one I knew that this had to be the one: Ina’s White Pizza with Arugula, chosen by Angela of Nummy Kitchen. I’ve been wanting to try a salad-topped pizza like this for some time, and this was just the excuse I needed to do it. There’s just something about the juxtaposition of warm, crisp, cheesy pizza topped with fresh, peppery greens and tart dressing that appeals to me on a very base level – I guess its just the unique satisfaction that only comes from that perfect balance of tastes and textures. The most involved part of this recipe is the pizza dough itself, and although I thought I had already found my go-to pizza dough recipe I decided to give this one a shot. I’m not sure if it was actually the recipe or the way I went about making it, but it came out head and shoulders above my old recipe. I tried to be patient with this one, adding the flour gradually to be sure I’d get the right consistency to the dough (soft and silky and pliable, unlike the rather dense dough the other recipe gives me) and I let it rise three times over the course of nearly 8 hours so that it could really develop some nice flavor and chewy gluten. I also used a 1-4 ratio of semolina/durham pasta flour to AP flour for a little extra complexity. The finished dough was extremely stretchy but delicate, admittedly difficult to shape and move, but with a light and airy quality that I’ve never achieved before. I opted to grill my pizza rather than bake it, partly because it was hellishly hot and humid the day I made this and the thought of turning on the oven was not even close to attractive, and partially because I still think that grilling is the ideal way to get that puffy but crispy crust which I’ve never quite accomplished indoors. It was a good decision, and the finished crust was as close to perfect as I think I will ever get making pizza at home. I brushed the crust with the garlic/thyme/crushed red pepper-infused oil and put it oiled-side-down on on the heated grill grate. The crust cooked until the bottom was just getting golden brown, then I brushed the top side with more of the oil and flipped it. Immediately the cooked side got another coat of the oil, some scattered slices of fresh mozzarella, Italian fontina, and low-fat feta (the original recipe called for goat cheese but I wasn’t really interested in that) and a sprinkle of diced red bell pepper. 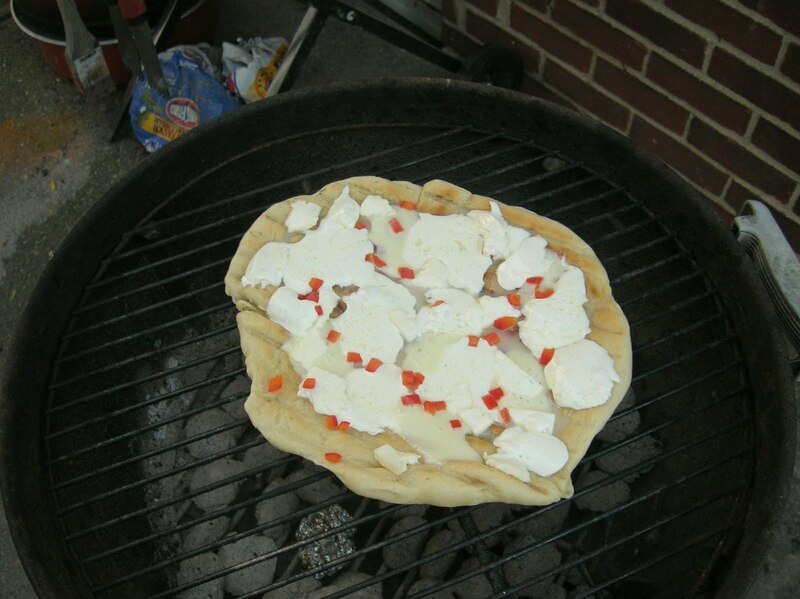 By putting the cover on the grill it was transformed into an oven, allowing the cheese to melt and the dough to cook through. About 5 minutes later, the pizza was perfectly browned and crispy on the bottom and gooey-melty on top. The pizzas get grilled on one side, flipped, and topped. They only need a few minutes to cook, so keep toppings light. Bringing the pizza back inside, I tossed some fresh young arugula in a dressing of lemon juice, olive oil, salt, black pepper, and a smidge each of sugar and spicy brown mustard for flavor balance and body. The dressed greens got piled on top of the hot pizza where they began to wilt just a bit, but before they had a chance to get too limp I sliced it in quarters and served it up. 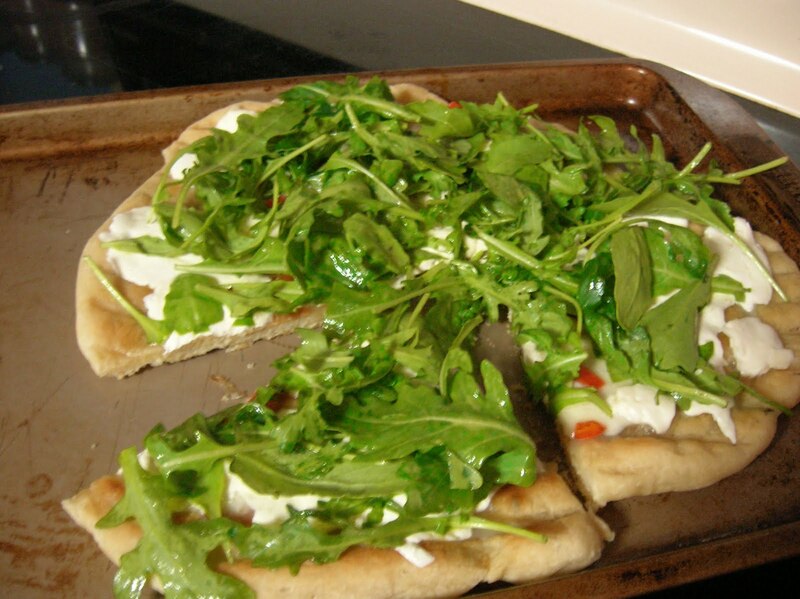 The hot pizza is topped with lightly dressed greens and is ready to serve! Man, was this tasty. The combination of cheeses, the perfect (seriously, I mean it, it was perfect) crispy crust, the peppery tangy greens, the occasional sweet pop of the red bell pepper – just delicious. Surprisingly light but totally satisfying, it was an ideal summer dinner. I would make this again in a heartbeat. As a matter of fact, I think I’d consider making this in personal pizza form at a bbq – a bit non-traditional maybe, but I think it’d be a hit. This entry was posted in Food, Drinks and Cooking, Table for Two? Archives and tagged barefoot bloggers, cheese/dairy, grilling, pizza, vegetables. Bookmark the permalink. 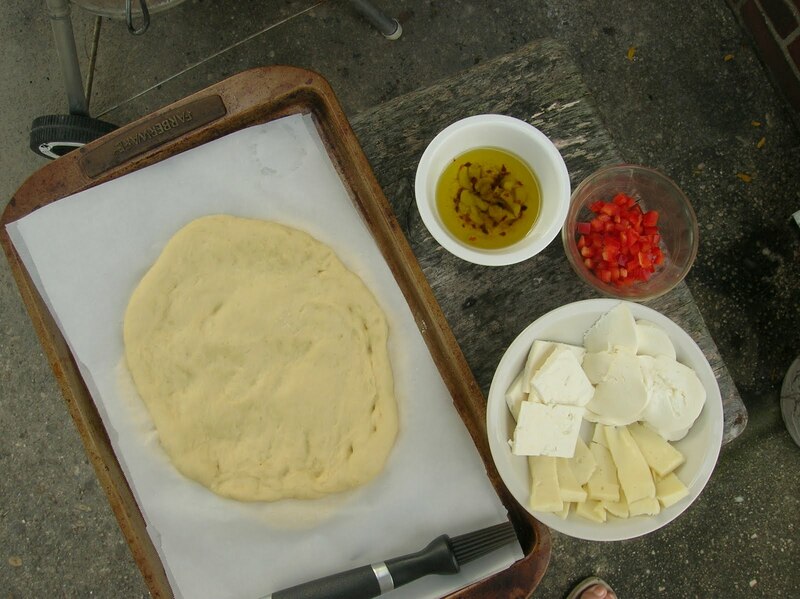 Looks wonderful, and I am bookmarking your notes on the dough for next time.